For many people we run into, lockpicking and key systems is a fascinating subject of which people have relatively little knowledge. We can’t blame them — most people have better things to do than sit around learning key trivia. However, with that being said, the more you know about keys and their locks, the more likely you’ll avoid incidents where you find yourself requiring the assistance of a locksmith. The master key system is one subject in particular that many people have questions about. How is it possible for one key to unlock so many doors? What makes the key so special? 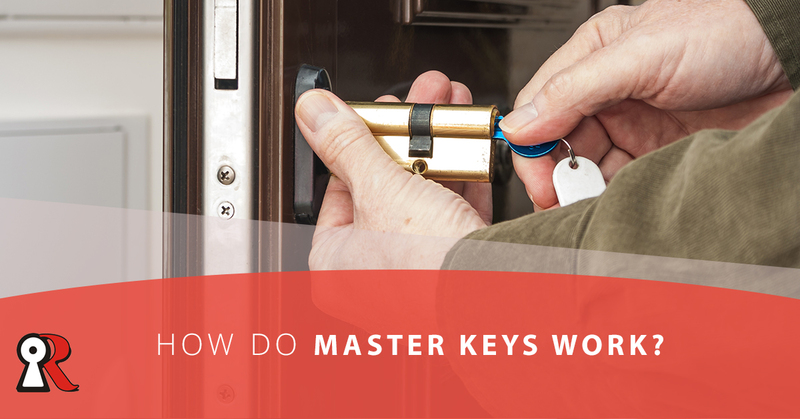 Here are some things to know about master keys and how they work. Let’s make one thing clear — if you’re anywhere that uses a master key system, it’s the locks that make the magic happens, not the keys. In another blog post, we detailed how a lock works. 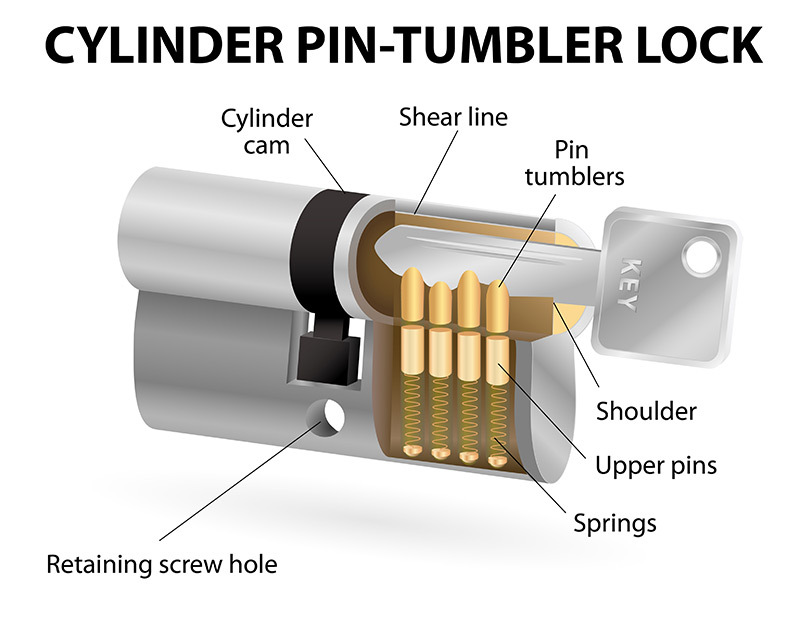 In a nutshell, there are tiny pins inside that are split at certain points — when the grooves of the key enter the lock, the pins are pushed up so that the splitting points form a horizontal line, allowing the mechanism to turn. If the pins don’t line up perfectly, they block the lock from being able to move. In a master key system, each of these pins has two partitions — one designed for the normal key, and one for the master key, allowing two different configurations to open the lock. So, imagine a normal lock. In a master key system, every single lock has a second partition in the pins that are fitted for the master key. This means that there are two correct configurations that will allow the lock to move — one that lines up with the normal key, and one that lines up with the master key. Frankly, if there was a key that could open any lock in an entire building (without the locks being specifically designed to accommodate it), we’d love to see it because it would be a feat of engineering. At Redlands Lock and Key, we can perform miracles with locks, being able to open locks that you’ve lost the keys to. We can also install new locks and provide new keys. Despite all that, we can’t magically produce a master key out of thin air for any given building complex — we have to use our old-fashioned locksmithing methods. That being said, if you’ve locked yourself out and your building happens to use a master key system, it might actually be easier for a locksmith to assist you. Because master key locks use a double pin system, they’re actually easier to pick. The reason for this is that there are two “correct” positions for a pin, so there are a lot more opportunities to pick the lock into a configuration that will allow it to turn. While we are adept at solving pretty much any problem caused by keys and locks, we are especially capable of helping you out if your building has a master key system. Although we don’t have access to the key itself, the way that the locks are built makes things slightly easier for locksmith professionals. Aside from that, we offer a variety of services to the people of Southern California, whether you’re in Redlands, Yucaipa, Loma Linda, Beaumont, Highlands, Colton, or any other of the surrounding areas. We can help you gain access to something you’ve been locked out of, install new locks, create new keys, and provide transponder key replacements. Contact us today!